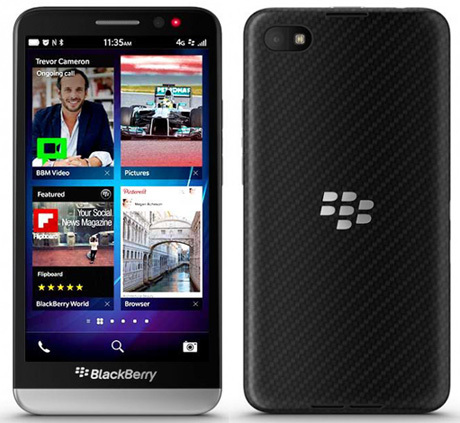 BlackBerry officially announced their latest big screen upgraded smartphone, BlackBerry Z30. It is an advanced version of its successor device Z10. BlackBerry Z30 has 5 Inch 1290x720p Super AMOLED Touchscreen with 295ppi image density. It has 1.7 GHz Dual core Snapdragon S4 Pro Processor with Adreno 320 GPU and enough 2GB RAM. The phone comes with 16GB of Internal memory and expandable with a microSD slot. It has non-removable 2880 mAh massive battery support. With 8Mp primary camera it can shoot Full HD 1080p videos. It is slightly thicker at 9.4mm than the previous model. BlackBerry's new Z30 has additional antenna technology which enhances signal reception in low-signal areas. The phone is 4G enabled, and NFC feature. BB's Z30 comes with latest BlackBerry 10 OS, V10.2. It includes features such as Priority Hub, Natural Sound. Comparing Z10's 356ppi, Z30 has lower 295ppi density, but surely with AMOLED type, it shows better color and wide viewing angles. Again Z30's specs are not competing with Galaxy S4 and HTC One or even with some in budget quad core processor phones as BB is just looking at their enterprise market customers to run their work pretty smooth. BB's Z30 will be available in next week in the UK and most of other areas. HSDPA, NFC, LTE, DLNA, Wi-Fi, Bluetooth, GPS, microUSB Port and microHDMI Port.